Painting your bathroom ceiling is something that can truly change the appearance of a run-down looking lavatory. In a matter of days, your dilapidated looking grooming space will be transformed into an entirely new room, and you’ll no longer have to worry about water spots that are on the ceiling or the flaking paint that had started to fall down into your vanity sink. In order to achieve the best results when renovating your ceiling, you need to know how to give the surface a professional paint job through preparation, specialized techniques, and choosing the right type of paint and colors that will work best with your decor. These interior decorating painting tips may sound simple, but a bit of work and careful preparation is involved, and you can’t skip a single step if you want to make sure that the end result is a professional and lasting remodeling job. Painting your bath ceiling is not a task that should intimidate you though, and if you follow our instructions carefully you too can finish your ceiling like a pro. Why pay someone to do it for you when updating your bathroom ceiling is something you can do yourself and save money? With the instructions below you will discover what kind of paint is best for your lavatory and what prep work you need to do in advance to get it done right the first time. Before even touching a brush or roller you have a little thinking to do. The first question you need to ask yourself is should your ceiling be the same color as your walls? Some homeowners prefer having a different color, as a little contrast adds interest to your décor and can make the structure recede or even appear visually closer. Still, the more traditional decorator prefers to have their entire bathroom painted in one single color to maintain consistency. So deciding on the color you want to use is the first step you should take. The second step is buying the right type of paint. What kind of paint is best suited for bath ceilings? Well, moisture is something that is always present in bathing spaces, and if excessive moisture builds up, it will lead to mold forming on your ceiling. Mold is neither pleasant looking nor healthy, so painting your ceiling requires high gloss paint. This will shield your walls from condensation and mold, so make sure to buy high gloss paint in whatever color you choose. For best results when designing your washroom, preparation is paramount. Having the right painting tools (brushes, rollers, paint trays, paint thinners, ladder or stool etc.) and knowing what to do will ensure your painting project will be a success. 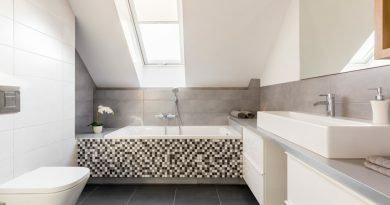 The preparation you perform will depend on your particular bathroom; for example, if you’re revitalizing an old moldy ceiling with paint, it will take much more prep than if your powder room is brand new and you simply want to change the color of the ceiling. Fixing a cracked and flaking ceiling with a fresh coat of paint is entirely possible as well, but it will require some extra time. Essentially you will have to scrape and remove everything off your ceiling that is not firmly attached. 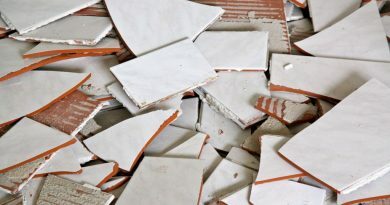 This means that everything that can be removed should be removed, including mold and any old flaking paint. Use a scraper for this and make sure that you get everything, because anything that remains on your ceiling will reduce the adherence of the new coat of paint and will show up as bumps under the paint. Also take off anything else that is on the ceiling, such as ventilator covers, exhaust fans or light fixtures so they won’t get in your way when you’re painting. Once everything is removed from your roof, you can sand the surface if you want, and this is especially recommended if you have mold. Sanding will remove the visible mold, and an anti-mold spray should take care of the rest before painting your bath ceiling. Feel free to skip this step if mold is not a problem for you! Now check your work and pay close attention to those areas of the ceiling where you’ve accidentally removed all of the paint and the drywall is visibly showing through. In these areas you need to get some drywall compound and apply a bit to the exposed surface with the scraper, making sure it is flat by sanding it down after it has cured. Once this is dry and complete, you can actually start painting your washroom ceiling! Make sure anything you don’t want paint getting on such as your toilet or vanity, is well protected with covers. Depending upon your preference you can get a separate primer and paint bucket, or you can purchase a brand that combines the two into one step, so painting doesn’t take as long. Who would have thought painting preparations could take such a long time? 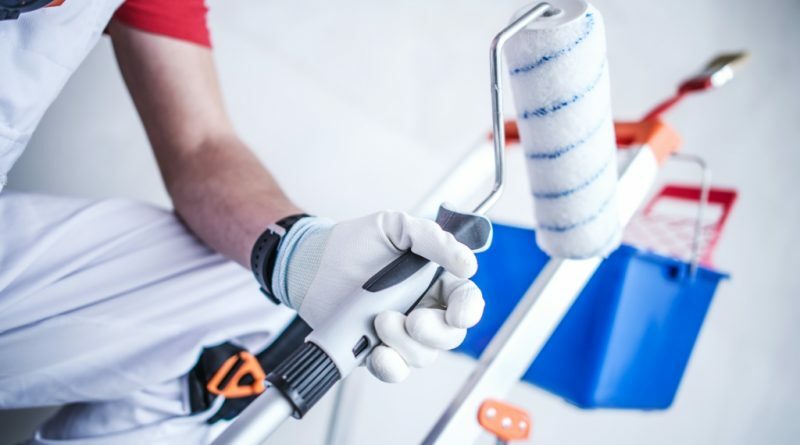 Using a roller to paint your ceiling is recommended, but you first want to prime the entire surface and also create a paint perimeter around the outer edges of your ceiling, using a regular brush, so you get paint into every nook and cranny at the edges and in the corners of your washroom ceiling. A conventional paint brush allows you to be more precise around the edges so you can quickly apply the rest of the paint with the roller. It is also important to carefully create the perimeter around your ceiling using the same level of paint consistency as you use for the roller. Painting Tip: the right consistency is achieved when the roller glides easily yet paint doesn’t drip off it. Feel free to use an extension pole for the roller if your ceiling is high and if you don’t want to move a ladder or stool around. Using a roller, painting your bathroom ceiling shouldn’t take long. Just make sure that you use the same amount of paint evenly distributed everywhere over the entire ceiling surface, because spots where you used more paint will be visible once the paint dries and your ceiling will appear to be molted. If you are looking for something different, feel free to be creative and use your imagination! If you want to create special patterns or motifs on your ceiling, and you’re feeling up to it, go for it! Just remember, that once you have painted your ceiling, you are the one who has to gaze up at it when you’re relaxing in your bath, so choose wisely. I guess the good thing is that If it doesn’t turn out the way you want it you can always just paint over it, now that you know how! Ceramic Tile – Is It a Good Choice for Your Bathroom?